This week was very pink, and my face matched because it is SO COLD, WTF CHICAGO. Cold but no snow, i.e. the worst part of winter. Grumble grumble. This week was the last before winter break so also lots of schoolwork, which also means crappy posts I don't even like in retrospect. Once again, grumble grumble. ON THAT NOTE, this week was the last before winter break! Yay! I can go sledding down a grassy hill and pretend it's white and make a snowman out of sticks. It will probably look a bit like this picture from a recent US Vogue Patrick Demarchelier story: New DIY idea? via. 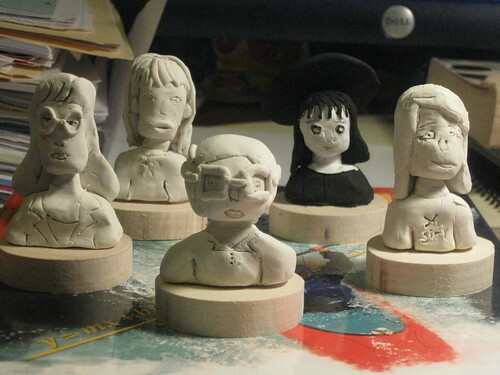 From left to right: Daria, Courtney Love, Enid, Lydia Deetz, and Kim Gordon. Daria: If you want to take a model's picture you'd be better off asking my beloved sister Quinn. Lydia: I'm sorry, it's for a /personal project./ Top secret. MY WORLD IS A DARKROOM. Enid: Your hat reminds me of umbrellas I once saw a couple satanists carrying. Kim: I am completely and totally epic and my Rodarte I always wear is epic. Man I've gotten so off topic. Pink! Right! hand-me-down button-down. labour of love capelet. old navy tights. rodarte for target skirt. monsoon accesorize headband. 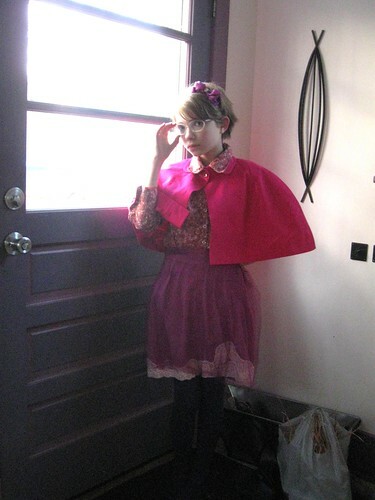 I looooove this capelet, it was an (amazing) gift from the folks at Labour of Love. Must do a glove-on-head/Dolce AW09/Schiaparelli thing with it soon. 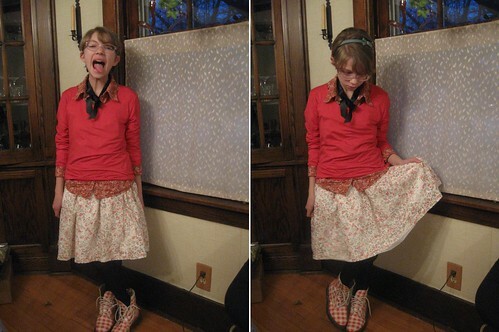 The skirt is another piece from the Rodarte for Target collection. 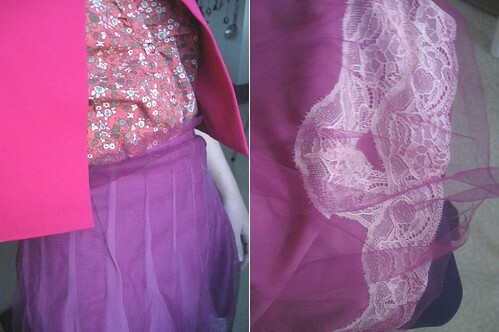 The light was being bipolar when I took these pictures but its color is closest to the shade in the lace detail below. The way the lace sort of rises is so weird and creepy and I totally love it? uniqlo sweater. same hand-me-down button-down. rodarte x target dress. walgreens tights. monsoon accesorize headband. vintage doc martens, gift. Wore this today for a field trip to see The Blind Side. I am worried I don't have a soul because the classmates in the row ahead of us kept saying "awww!" whenever the camera would show Michael and eventually I told them to shut up because he's not a kitten or anything. I did bawl like a baby at some parts though. Anyway this Uniqlo heattech sweater came yesterday and it is totally epic. The material is ridiculously soft and the color is so rich that I will take the trouble to click the italics button. I noticed when it came that it was practically the same color as the flowers in this Rodarte x Target dress so had to wear them together of courseeee. The dress is painted lace and makes me desperately want Spring. It's halter with a black ribbon at the neck so one day I'll take a creepy picture with it where my neck is all bloody or something. Does hanging Edward Gorey posters right next to your bed affect your thoughts on everything? Perhaps. And because of the new law, I am supposed to let you know that I receieved compensation and pieces from the Rodarte for Target collection for my collaboration with Target. Aaaand a pair of my favorite shoes! Spencer's mom gave them to me forever ago but they're sort of secret special things I don't like sharing but here they are anyway. 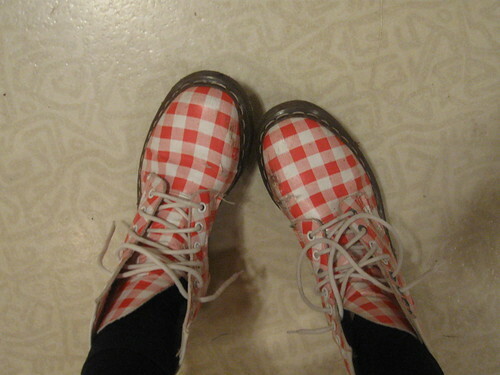 They look super rad with this blue gingham coat I have. Once again...stay tuned for a giveaway this evening! And happy happy friday!